The chapter analyzes the rationales for excluding relevant evidence with the aim of establishing the ideal type of exclusion system for each rationale. The authors then review to what extent individual legal systems have actually altered their legal rules in accordance with these ideal systems. An investigation into whether or not there are any consistent relationships between the ideal systems and proclaimed rationales is conducted. 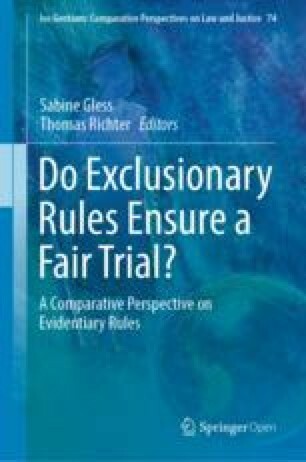 The structure of various exclusionary rules is also explored, as are other factors that may influence the law and practical application of such rules. Portions of Jenia Turner’s contributions to this chapter draw on her previous work in Turner, 2016; Turner, 2014. In adversarial systems, exclusion can be based on the logic that a party which obtains a piece of evidence illegally should not be allowed to benefit from the fruits of the violation. In inquisitorial systems, it is more difficult to rely on this rationale of exclusion because evidence is regarded as “belonging” to the court, not to one of the parties. Still, there are overriding concerns that may justify a court’s decision to exclude a piece of evidence. Such concerns can be related to systemic interests (e.g., the appearance of fairness) or individual interests (e.g., vindication of the rights of the individual affected by the violation). Each of these interests may be so important as to outweigh the procedural interest in having the full range of relevant evidence available at the trial. Every legal system recognizes exclusionary rules as a reaction to particularly serious violations. There is an almost universal rule that statements made as a result of torture must not be used in court.2 But beyond this common core, the breadth and contents of exclusionary rules differ widely. In some jurisdictions, the law generally prohibits the admission of any evidence obtained illegally.3 Other states are more reticent and recognize only a limited number of “absolute” exclusionary rules, leaving exclusion in other cases to the discretion of the court, or permitting the admission of illegally obtained evidence if the interest in making use of it for “finding the truth” outweighs the taint of its illegal acquisition. At the same time, legal systems differ with respect to the purposes they proclaim to pursue by excluding illegally obtained evidence. In some systems, the integrity of fact-finding or of the judicial system as such is the most prominent concern that supports the exclusion of evidence. In other systems, deterrence of police misconduct is foremost. In yet others, the principal justification for exclusion rests on the protection of individual rights. The general tendency toward protecting human rights that has prevailed in the last few decades has given a boost to such considerations. In this chapter, we will start out by analyzing the potential rationales for excluding relevant evidence (Sect. 2) and will then attempt to construe ideal types of exclusion systems based on each rationale (Sect. 3). We will then review to what extent individual legal systems have actually devised their legal rules in accordance with these ideal types (Sect. 4). By way of conclusion, we will ask whether there is any consistent relationship between the ideal types based on the proclaimed rationales and the actual configuration of exclusionary rules, and what other factors may in fact influence the law and practice of excluding evidence (Sect. 5). In this chapter, we review the most common rationales used to support the exclusion of unlawfully obtained evidence. We will first deal with system-related considerations, such as promoting the search for truth and the integrity of the criminal justice system. We will then examine deterrence of police misconduct and protection of individual rights as justifications for excluding evidence. In order to properly fulfil its functions, any procedural system, regardless of whether it is party-oriented or court-centered, must meet certain basic requirements: A functional procedural system needs to present courts as principally fair and oriented toward a just disposition of cases in accordance with the law; this includes an orientation of fact-finding toward the “truth”, or more realistically, a renunciation of court decisions based on evident fiction. Courts are encouraged to pursue these basic goals through admitting and taking into consideration any evidence that appears to be factually relevant for the disposition of the case. The reliability-based rationale has a limited area of application, however. It rarely comes into play with regard to physical evidence. When drugs are seized illegally or a telephone conversation is taped without a necessary judicial warrant, the unlawful government action does not in any way reduce these items’ probative value. Therefore, excluding such evidence would undermine the search for truth instead of advancing it. To the extent the integrity rationale emphasizes the integrity of the individual judicial process, it tends to support robust, categorical approaches to exclusion. But in another variant of this rationale, also known as “systemic integrity,” the focus is more broadly on “not bringing the administration of justice into disrepute.”9 This version of the integrity rationale recognizes that while exclusionary rules may contribute to the propriety of the criminal process, they can also undermine the acceptance of the criminal justice system if they lead to the non-prosecution or acquittal of persons who are most likely to be guilty of serious crime. The public may lose faith in the proper functioning of the system if courts frequently exclude reliable evidence and consequently fail to convict because crucial evidence is then missing. Exclusion for “deterrence” purposes is based on the assumption that police officers, even if they are not at all times focused on respecting procedural safeguards, have a strong professional interest in seeing offenders convicted. By excluding evidence that the officer had acquired in violation of the law and thereby dramatically reducing the odds of conviction, courts hope to nudge police officers toward complying with the law in the future. It is not by chance that the notion of excluding evidence for the purpose of deterring unlawful police conduct has played a great role in the United States, following revelations of grave and systematic police violations of suspects’ rights in the U.S. legal system in the 1960s.13 Exclusion of evidence obtained through the use of illegal police methods was seen as an indispensable means for re-establishing the integrity and public acceptance of the criminal justice system. The skepticism toward the idea of deterring police misconduct by excluding evidence from trial may be well-founded. There exists at best a tenuous psychological connection between excluding evidence of past misconduct and preventing future ones: the mechanism of “deterrence” can function only if: (a) offending police officers are informed of the forensic fate of the individual criminal process, and (b) they care about that fate. The empirical foundations of either precondition is doubtful, however.20 Especially if police use torture or other unlawful means for purposes other than obtaining evidence to be used in criminal proceedings (e.g., because they wish to humiliate members of an ethnic group or because they are looking for information unrelated to criminal proceedings), the fact that statements obtained through their acts are inadmissible at trial will have little influence on their behavior. Regional human rights courts, by contrast, have in recent years begun to prod states to provide for exclusion of evidence obtained through human rights violations. Human rights law requires states to ensure the protection of, inter alia, the right to a fair trial,25 the right to be free from arbitrary searches and seizures,26 the right to privacy,27 and the right not to be compelled to testify against oneself.28 The domestic implementation of provisions protecting human rights has made states aware of the need to adopt mechanisms that can effectively safeguard these rights. Human rights courts tend to leave questions of the admissibility of evidence to individual states and do not generally require that evidence be excluded if gathered in violation of one of these rights.29 But they mandate exclusion of statements obtained through serious violations of fair trial such as entrapment of innocent citizens to commit crimes,30 torture or degrading treatment,31 and in the Inter-American human rights regime, even of statements obtained through lesser forms of coercion.32 Human rights law has thus, directly as well as indirectly, contributed to the expansion of exclusionary rules designed to protect human rights. However, the functional relationship between the exclusion of evidence and the protection of human rights is less than clear. One can conceive of exclusion as a mechanism for preventing future human rights violations; exclusion is to demonstrate to potential violators that it is not worthwhile to use torture or other prohibited methods because evidence obtained thereby will not be admissible in court. This is the logic of deterrence of police misconduct, which we have mentioned above (Sect. 2.3). But it is an open question whether (and why) the criminal justice system should be obliged to contribute to a better protection of human rights. Exclusion may have an indirect positive effect on reducing human rights violations, but its undeniable direct effect is a reduction of the factual basis on which the court’s verdict can be based. It is thus the criminal justice system that has to pay the price for the possible improvement in human rights protection. The main argument in favor of exclusion from a human rights perspective is, however, not systemic but individualistic: inadmissibility is to provide the victim of the violation with some kind of compensation. This argument, however, suffers from several flaws. First, compensation of this kind is provided only for a relatively small portion of victims of human rights violations, i.e., those who are subsequently subjected to a criminal trial. Second, exclusion can apply only if the human rights violation produced evidence relevant to a criminal case. Third, exclusion of evidence may give little satisfaction to the victim of a serious violation if the piece of evidence in question is of little significance to the outcome of the case and its exclusion does not preclude conviction.33 In sum, exclusion of evidence affects only a very small, fortuitously composed portion of victims of human rights violations, and even for that group, its compensatory effect is dubious. On the other hand, acquittal of a serious offender may be over-compensation for a minor violation of his procedural rights. For example, if an officer conducts a car search based on a good faith belief that she has sufficient cause to do so, but a court later disagrees and excludes a murder weapon seized in the search, so that the defendant is acquitted for lack of evidence, acquittal may be seen as an out-of-proportion reaction to the invasion of the defendant’s privacy. And even if exclusion is not disproportionate—should the “criminal” go free because the constable has blundered? The fact that a police officer violated a defendant’s rights does not in any way reduce the defendant’s blameworthiness for the act he committed; and although he should be compensated for the violation of his rights, the exclusion of relevant evidence lacks an inherent nexus with the injury the defendant suffered. The compensation rationale for the exclusion of evidence is, in sum, less than convincing. It might be useful, on the basis of the above considerations, to limit exclusion to instances in which the production of evidence in court would itself violate a person’s human rights. This would be the case, for example, if the transcript of an illegally taped telephone conversation between the defendant and his wife would be read in open court, because disclosing this conversation to the public would be a new violation of the couple’s right to marital intimacy. By contrast, the introduction of drugs discovered in the defendant’s car through an illegal warrantless search would not, by itself, violate the defendant’s human rights. In this section, we briefly sketch possible consequences of a system’s decision to opt for one of the key exclusionary rule rationales discussed above: systemic integrity, deterrence, or protecting human rights. We do this by constructing ideal types of exclusionary regimes, that is, by postulating consequences from their underlying purposes without taking into account the individual factual and normative conditions and limitations of any specific legal system. In defining the ideal types, we cannot deal with all details and possible ramifications of exclusionary regimes; we will therefore focus on several key doctrinal questions that have the potential of differentiating between systems and also have significant practical effect. In this regard, we will highlight five aspects of the application of exclusionary rules: (a) whether there is a strict exclusionary rule or whether it is subject to balancing; (b) whether the decision to exclude depends on the specific right that has been violated; (c) whether the officer’s good faith precludes exclusion; (d) whether evidence indirectly derived from the original violation is excluded; and (e) whether exclusion can be invoked by persons whose rights were not directly violated. If the purpose behind excluding illegally obtained evidence is to preserve or restore the integrity of the judicial system, declaring inadmissible any evidence acquired in violation of a procedural rule might be counterproductive because exclusion itself can jeopardize the (perceived) integrity of the judicial process by leading to verdicts based on fiction rather than truth. Balancing between the interest in basing the judgment on the totality of available relevant evidence and disregarding items of evidence whose use would “shock the conscience” seems to be the optimal approach under this rationale. If the integrity of the criminal justice system is the purpose of exclusion, the type of right violated (e.g., privacy, bodily integrity, secrecy of telecommunications) should not play a decisive role, because all individual rights protected by applicable international or domestic law are part of the system and require equal respect. For the purpose of balancing, it is therefore irrelevant which individual right has been compromised34; it is only the intensity and scope of the violation that needs to be considered in the weighing process. Although the right to freedom and the right to bodily integrity both deserve protection under the “integrity” approach, a statement made by the defendant at the police station is more likely to be excluded if he was tortured than if police detained him for an hour longer than was permissible under the applicable law. If, however, the finding of the “truth” is regarded as an important systemic interest, it matters whether the violation is likely to affect the reliability of the evidence in question. Accordingly, evidence derived from torture or coercion should be excluded, whereas violations of other important rights, such as the right to the privacy of telecommunication, should not necessarily lead to suppression. Even if the type of right violated should not matter in a system promoting integrity, it can be argued that the sanction need not always be exclusion, but could instead vary based on the seriousness of the violation. On the other hand, it cannot be denied that the origin of the chain that leads to the acquisition of a piece of evidence can be so abhorrent that a system geared toward integrity should refrain from using it—for example, if the suspect had disclosed the place where drugs were hidden only after having been brutally tortured. A legal system that places great emphasis on the rule of law would therefore be inclined to exclude derivative evidence at least in cases of serious violations. A sensible solution to this dilemma may be to resort to balancing the interests involved: there should not be an absolute rule of admission or of exclusion, but the “taint” on the individual item of evidence stemming from the origin of its discovery should be weighed against its relevance for a just outcome of the process. If exclusion of evidence is designed to maintain the integrity of the judicial system, anybody should be entitled to raise the issue of exclusion. This means that a defendant should be able to demand exclusion even if only the rights of another person had allegedly been violated when the evidence was obtained. For example, a defendant would be able to claim that the search of a witness’s home was illegal and that therefore contraband found in the home should not be introduced as evidence at the defendant’s trial. Moreover, it would be consistent with this approach that the court could (and indeed, should) exclude illegally obtained evidence on its own motion, even if none of the parties requests exclusion. A system justifying exclusion of evidence by the interest of maintaining the integrity of the judicial process would have these features: The interest in excluding illegally obtained evidence is weighed against the interest in having a complete array of relevant evidence available for the judgment.39 There is hence no absolute rule of exclusion; the degree of the violation and the importance of the individual rights affected are parts of the balancing process, and so is the question of whether the item in question has been directly or indirectly obtained through an illegal method. Questions of standing do not play a role in the decision on exclusion: any participant in the trial (and indeed, the court) can trigger an examination of possible exclusion by claiming that a piece of evidence was obtained illegally. If deterrence is the principal goal of exclusion, a categorical approach toward exclusion seems warranted. Deterrence will work only if law enforcement personnel are certain that their investigative efforts will be in vain if they resort to forbidden methods. On the other hand, a judicial system may balance the interest in deterrence against other procedural interests, such as that of establishing the truth and of enforcing the criminal law, thereby carving out different categories of illegal conduct. If deterrence outweighs competing considerations (for example, in instances of systemic or deliberate misconduct), evidence will invariably be excluded. If, on the other hand, deterrence benefits are marginal while social costs are significant (for example, where the officer has relied in good faith on an illegal warrant issued by a magistrate), evidence will be admitted. Under a deterrence approach, the type of right violated should not affect the decision whether to exclude evidence. The focus in this model is on encouraging police officers to abide by the law, not on the effect that the misconduct has on the individual. On the other hand, one could argue that if an officer is violating only a minor administrative regulation, deterrence is of lesser importance and exclusion of evidence would be an over-reaction. Other than in such extreme cases, however, courts focused on deterrence ought not to differentiate as to the type of the right that had been violated. Some scholars have contested this narrow view of deterrence as being too focused on individual officers rather than on police departments as a whole.42 Commentators have further argued that negligent mistakes can and should be deterred and that exclusion therefore should not be limited to reckless or deliberate misconduct.43 Under this view, the threat of exclusion would provide an incentive for police departments to conduct better training to minimize even negligent errors. Exclusion of derivative evidence should be favored under the deterrence paradigm, because police officers might be encouraged to employ forbidden methods if they know that derivative evidence can later be used in order to convict the suspect. If, however, the link between the violation and the evidence at issue is strongly attenuated, exclusion may not be warranted for deterring similar violations. For example, if the police arrest someone unlawfully, the person is subsequently released, and then returns to the police station to make a voluntary confession, this statement may be too distant from the unlawful arrest to warrant exclusion44: An officer in a similar situation would not expect that a person would voluntarily return to make a confession, and therefore is not likely to be deterred from misconduct by exclusion of the confession. If exclusion of evidence is designed to deter misconduct, anybody should be entitled to raise the issue of exclusion, just as under the judicial integrity approach. A deterrence-based approach to the exclusion of evidence would have a relatively strict and categorical approach to exclusion in order to provide clear guidance to officers and minimize the likelihood of misconduct. The type of right violated and the question whether the item in question was directly or indirectly obtained through an illegal method would generally not be central to the question of exclusion, while the offending officer’s culpability and the systemic nature of the misconduct would be. To maximize deterrence of misconduct, any participant in the trial should have standing to demand exclusion, even if his or her rights were not directly violated by the action that led to the acquisition of the evidence. In a human rights centered ideal type, exclusion of evidence is a logical and unavoidable consequence of the violation of a procedural rule protecting the individual. There is no balancing against procedural interests; to the extent such interests are taken into consideration, they remain external to the rationale of exclusion. The only “internal” limit to exclusion would be its waiver by the affected individual: If the defendant does not object to the introduction of the tainted evidence, there is no reason for excluding it. Under this rationale, exclusion should ensue only if an individual right has been affected; a violation of general interests of the procedural system (e.g., the illegal exclusion of the public from the trial, or the unlawful disclosure of state secrets) cannot lead to the exclusion of relevant evidence. One could consider gradating human rights and attaching exclusion only to the violation of those rights deemed particularly important. But the admission of evidence obtained in violation of any human right protected by international law or domestic constitutional law would be difficult to reconcile with this rationale. From a human rights perspective, it makes little difference whether the officer conducting an unlawful search or interfering with a person’s core privacy acted in good faith. What counts is the unlawful intrusion by a state agent into the protected sphere of an individual. A “good faith” exception would thus not be compatible with a human rights rationale. If exclusion of evidence is to reinstate the victim of a human rights violation to his or her prior status and to deprive the state of the fruits of the violation of human rights, exclusion should extend to the “fruits of the poisonous tree.” Evidence derived from information obtained by a human rights violation thus should not be admitted if there exists a clear and direct causal connection between the violation and the acquisition of the evidence. Although rules on standing can be informed by various procedural considerations, the logic of the human rights rationale suggests limiting standing to the individual affected by the violation (or his survivors if he was killed). In summary, the ideal type of an exclusion system based on a human rights rationale has these key features: Exclusion of evidence is an invariable consequence of any violation of an individual human right. Exclusion extends to violations that occurred unintentionally and also to evidence indirectly derived from the original violation. Only the individual affected has standing to demand exclusion; he or she may also waive exclusion, which is binding on the court. Do real world systems reflect the ideal types described above? Can we detect any doctrinal patterns based on the rationale adopted? Legal systems do not tend to subscribe unconditionally to the ideal types as described here. In fact, many jurisdictions ground their exclusionary rules on more than one rationale. The mix of rationales—which the law often fails to spell out clearly—makes it difficult to predict the actual scope of exclusionary rules in any given legal system. Even where one rationale is dominant, courts and scholars often seek to accommodate subsidiary rationales as well. They may do so expressly by adopting a balancing test, or indirectly by carving out exceptions to categorical rules. In this section, we examine to what extent selected legal systems rely on one of the doctrinal bases identified above, and how that choice is reflected in the actual features of exclusion of illegally obtained evidence. For that purpose, we group legal systems along the three ideal types identified above, i.e., “system integrity,” “deterrence,” and “human rights,” and then examine whether their choice of rationale bears on their position concerning the distinctive issues treated above (Sect. 3). Canada and Israel are examples of legal systems that ground their exclusionary rule on a systemic integrity analysis.45 Consistent with expectations, both systems apply a multi-factor, balancing test in deciding whether to exclude unlawfully obtained evidence. Empirical studies of rates of exclusion, however, suggest that the Canadian balancing test is more robust and more likely to produce exclusion than the Israeli approach. This short overview of two systems that both rely on an integrity approach to exclusion shows some similarities but also suggests that the same approach can yield different doctrinal paths. On some of the doctrinal touchstones, the two systems are in harmony and in line with our expectations, but in other regards both of them depart from the model of system integrity outlined above. In the United States, the exclusionary rule is based on a deterrence-oriented analysis. Consistent with the expectation of the model, the U.S. approach is relatively rule-bound and categorical, at least when compared with the more flexible balancing used in other jurisdictions.59 If the police violate the Constitution, the exclusionary rule is presumed to apply, unless the prosecution can rely on a specific exception. On the other hand, the U.S. Supreme Court has in recent years applied a cost-benefit analysis, weighing the deterrence benefits of exclusion against its social costs. This approach has led to the recognition of an increasing number of exceptions to the exclusionary rule60 and is moving the U.S. away from a purely deterrence-oriented model toward the system integrity approach discussed in the previous section. Concerning the possible differentiation among various rights, the U.S. Supreme Court has not expressly acknowledged a differential treatment based on the right violated, yet its jurisprudence shows that mandatory exclusion is more likely to apply to coerced confessions, unlawful searches of a home, and particularly invasive body searches. By contrast, a cost-benefit analysis is more likely to result in admitting the tainted evidence when violations of seemingly less important rights—such as violations of the “prophylactic” Miranda regime—have occurred.61 This gradation is not fully consistent with a purist deterrence model, which would generally not distinguish among rights violated. In this context, the Court seems to be mixing rationales, weighing the goal of truth-seeking, on the one hand, against the goal of deterring misconduct. We thus see that, like Canada and Israel, the United States is another example of a system that in practice departs in several respects from the exclusionary model it purports to follow. Although the Greek system comes close to the ideal type of a human rights based system, it does not fit the model in all respects. For example, courts have fashioned broad standing rules that allow third parties to invoke the exclusionary rule.73 Under a strict individual-rights perspective, this is surprising (see Sects. 3.1.5, 3.2.5 and 3.3.5). But perhaps the broad Greek rule can be explained by the fact that Greece aims at making sure that no evidence based on human rights violations will be accepted by the courts, even when this may overcompensate individual litigants in some cases. The Greek and Irish systems of exclusion suggest that even seemingly absolute, rights-oriented approaches to exclusion at times give way to exceptions or balancing tests.82 As the next section elaborates, the mixing of rationales is perhaps the most common approach to exclusion in practice. Several legal systems have refrained from defining a single rationale for their exclusionary rules. Three of the countries discussed in this volume—Switzerland, Germany, and Taiwan—are examples of such hybrid systems. Many “mixed” systems take the culpability of the officer into account when deciding on admissibility of evidence. In Taiwan, for example, one factor in the balancing analysis is “the subjective intentions of the official, i.e., whether the official knows his conduct is unlawful.”89 German courts are also more likely to exclude evidence where officers have purposefully or recklessly violated the law.90 A similar inquiry into the officer’s motivation and state of mind occurs with respect to indirect evidence in Spain.91 It is possible that the consideration of the officer’s state of mind in these systems is a nod to a subsidiary, competing rationale—to deter police misconduct or to safeguard the integrity of the criminal justice system. 5 Conclusion: Aligning Doctrines with Rationales? Looking at our findings from a comparative standpoint, the rationales that different systems rely upon do not fall into an expected pattern. No clear divide exists between adversarial and inquisitorial systems. A trend we do identify, however, is that for most systems, particularly those that have adopted exclusionary rules relatively recently, the dominant rationales for exclusionary rules are to protect individual rights and promote judicial integrity rather than to deter misconduct or promote the search for truth. This development can probably be attributed to the growing influence of international human rights law and to an emphasis on the rule of law in countries transitioning away from authoritarian regimes. Not surprisingly, we have not encountered a legal system that exactly mirrors one of the ideal types construed in section 3. To begin with, virtually all the countries we examined pursue more than one goal when excluding evidence, even if one objective may be dominant; and the majority of systems rely on a mix of rationales to support their exclusionary rules. But even where a legal system expresses a pronounced orientation toward a “human rights” or a “deterrence” rationale, such as Greece and the United States, respectively, the choice of rationale does not necessarily seem to determine the resolution of the key issues we have identified. Of course, quite a few of our findings comport with the ideal-typical models. The emphasis on protecting individual rights has led countries such as Greece, Ireland, and Russia to adopt—at least on paper—broad and categorical exclusionary rules; and “hybrid” systems such as Germany and Switzerland have embraced a broad balancing approach designed to make it possible to find compromise between conflicting interests in each case. Contrary to expectations, however, the United States—although oriented toward deterring police misconduct—limits standing to persons directly affected by the violation that led to the evidence, whereas Greece—although professing adherence to a “human rights” rationale—grants standing to individuals who were not personally affected by the human rights violation in question. On the other hand, adopting the same rationale does not necessarily lead to identical doctrines of exclusion, as can be seen from the examples of Israel and Canada. Instead, one and the same rationale can justify a variety of approaches to exclusion, from balancing to categorical exclusion and from relatively narrow to relatively broad rules. These variations can easily be explained by the fact that even legal systems which emphasize a single basic rationale for exclusion reasonably take other considerations and interests into account when shaping rules on individual issues. Certain overriding considerations appear to influence exclusionary decision-making to a larger extent than adherence to basic rationales. For example, legal systems are most likely to use absolute exclusionary rules with respect to violations of certain fundamental rights, such as the right not to be subjected to torture. When rationales coincide, and especially when the truth-seeking rationale weighs on the side of exclusion, legal systems are most likely to exclude evidence. Policy considerations can also be expected to have a great influence on the design of actual exclusionary rules. For example, legal systems that regard police misconduct as a serious problem—such as the United States in the 1960s and 1970s—can be expected to establish broad exclusionary rules but to limit them to bad-faith disregard of citizens’ procedural rights; systems which have faith in police to obey the legal rules will see less need to shape their exclusionary rules in order to achieve deterrence. In sum, we can say that a strict doctrinal adherence to particular rationales and purposes of exclusion of evidence plays a lesser role in the construction and application of exclusionary rules when compared to considerations of fairness, procedural expediency, and an interest in keeping a balance between the truth-orientation and the rights-orientation of the criminal process. The official purposes of excluding evidence are of course welcome arguments for supporting individual sub-rules and court decisions; but they are not determinative. Judges who shape and apply legal rules in difficult areas do not simply apply doctrines but take real life and basic notions of fairness into account. And that is probably how it should be. This chapter focuses on illegally obtained evidence and therefore does not discuss rules that some legal systems use to exclude evidence in order to “absolutely” protect specific interests, e.g., the core of the right to privacy, even in the absence of police misconduct. Art. 15 UN Convention against Torture (1984) (“Each State Party shall ensure that any statement which is established to have been made as a result of torture shall not be invoked as evidence in any proceedings, except against a person accused of torture as evidence that the statement was made.”). Greece is an example of such an absolutist approach to exclusion. See Giannoulopoulos, 2007, p. 181. Macula, 2019 at 3; R v. Grant  2 SCR 353, § 110 (Can. ); Chalmers v. H.M. Advocate 1954 JC 66, 83 (Scot. ); Israel Supreme Court, Yissacharov v. Chief Military Prosecutor, Judgment of 4 May 2006, CrimA 5121/98, § 71 (Justice Beinisch); Strafprozessordnung (Ger.) § 136a. See, e.g., ECtHR, Gäfgen v. Germany, case no. 22978/05, Judgment (Grand Chamber) of 1 June 2010, § 175 (“Indeed, there is also a vital public interest in preserving the integrity of the judicial process and thus the values of civilised societies founded upon the rule of law.”). Like other courts and writers, the ECtHR here refers not only to “the integrity of the judicial process” but also to the “rule of law.” The latter is a very basic value of any judicial system. However, exclusion of evidence does not specifically promote the “rule of law,” because the law can provide for different ways of dealing with illegally obtained evidence. By contrast, “the integrity of the judicial process” (or, for short, “judicial integrity”) describes the specific interest potentially violated by admitting tainted evidence. Elkins v. United States, 364 US 206, 223 (1960); see also Israel Supreme Court, Yissacharov v. Chief Military Prosecutor, Judgment of 4 May 2006, CrimA 5121/98 (Justice Beinisch), § 45 (“[T]he administration of justice is also based on the way in which the court reaches its decision in the circumstances of the case before it. Basing a conviction on evidence that was obtained in an illegal manner or by means of a substantial violation of a protected human right allows the investigation authorities to enjoy the fruits of their misdeed and it may create an incentive for improper acts of interrogation in the future. Admitting such evidence may be seen as the court giving approval to the aforesaid illegality and being an accessory, albeit after the event, to the improper conduct of the investigation authorities. Consequently, in certain circumstances admitting the evidence in court may prejudice the fairness and integrity of the judicial process.”). This rationale has been particularly influential in countries emerging from authoritarian regimes and transitioning to liberal democracy. In those countries, the exclusionary rule has been valued for curtailing government abuse and for affirming that even government officials are subject to legal restraints. See Turner, 2014. Canadian Charter of Rights and Freedoms, Part I of the Constitutional Act, 1982, being Schedule B to the Canada Act, 1982, c. 24 (U.K.) (“[T]he evidence shall be excluded if it is established that, having regard to all the circumstances, the admission of it in the proceedings would bring the administration of justice into disrepute.”); R v. Grant  2 SCR 353, §§ 68–70 (Can.). See Slobogin, 2016 at 287–291. United States v. Leon, 468 US 897, 918 (1984); Hudson v. Michigan, 547 US 586, 591 (2006); Herring v. United States, 555 US 135 (2009). Miller/Wright, 2007 at 521–522 (discussing the findings of the Wickersham Commission). United States v. Leon, 468 US 897, 907 (1984); Hudson v. Michigan, 547 US 586, 591, 599 (2006); Herring v. United States, 555 US 135, 141 (2009). Hudson v. Michigan, 547 US 586, 591, 599 (2006). Herring v. United States, 555 US 135, 144 (2009). See, e.g., Macula, 2019 at 3.1.1. See Grünwald, 1966 at 499–500; Spendel, 1966 at 1104–1105. Küpper, 1990 at 417; Jäger, 2003 at 69–71. Alschuler, 2008 at 1374 (reviewing U.S. studies of the exclusionary rule’s deterrence effect and concluding that while the exclusionary rule does not have a direct and immediate deterrent effect on officers’ behavior, it “works over the long term by allowing judges to give guidance to police officers who ultimately prove willing to receive it”). Israel Supreme Court, Yissacharov v. Chief Military Prosecutor, Judgment of 4 May 2006, CrimA 5121/98 (Justice Beinisch), § 61; Ashworth, 1977; Jackson/Summers, 2012, at 155. Silverthorne Lumber Co. v. United States, 251 US 385, 392 (1920). Weeks v. United States, 232 US 383, 393 (1914). ICCPR art. 14(1); ECHR art. 6. ICCPR art. 17; ECHR art. 8. ICCPR art. 14(3); ECHR art. 8. See, e.g., ECtHR, Khan v. United Kingdom, case no. 35394/97, Judgment of 12 May 2000, (31 Eur. Ct. H.R. 45), § 34. See, e.g., ECtHR, Furcht v. Germany, case no. 54648/09, Judgment of 23 October 2014, §§ 62–64. ECtHR, Gäfgen v. Germany, case no. 22978/05, Judgment (Grand Chamber) of 1 June 2010, §§ 166–168; see UN Convention Against Torture and Other Cruel, Inhuman or Degrading Treatment or Punishment, art. 15. American Convention on Human Rights, art. 8(3) (“A confession of guilt by the accused shall be valid only if it is made without coercion of any kind.”). For example, an intrusive bodily search of a suspect conducted by police without probable cause and without a warrant may produce evidence of drug-dealing (i.e., the drugs themselves) that is relevant but not crucial to the case against the suspect; its exclusion would hardly compensate the victim of the illegal search for the harm done to him. One might consider affording human dignity a special status; but given the vague contours of human dignity, a rule of absolute exclusion whenever human dignity had been infringed may lead to inappropriate results. See, e.g., Evidence Act 1995 (Cth) s 138(3) (Austl. ); Evidence Act 2006, § 30(3) (N.Z. ); R v. Grant  2 SCR. 353, §§ 73–75 (Can. ); R v. Canale  91 Cr. App. R. 1 (Eng. ); Israel Supreme Court, Yissacharov v. Chief Military Prosecutor, Judgment of 4 May 2006, CrimA 5121/98, § 62 (Justice Beinisch). See, e.g., R v. Nasogaluak  229 CCC (3d) 52 (Alta. C.A. ); Butler/Butler, 2005 at 1037 § 29.6.5. Borgers/StevensLonneke in Thaman, 2013 at 183, 190. An exception to this presumption would be a second confession following an initial coerced confession. Studies of wrongful convictions have shown that, once a person has given a false confession under pressure from the police, the coercive influence of the first confession might lead to a second false confession, even when police are no longer applying deceptive or coercive tactics. If the focus is on promoting the rule of law in systems that have recently moved to liberal democracy, perhaps there is a greater need for categorical rules because of concerns that a “balanced” exclusionary rule would be toothless. United States v. Leon, 468 US 897 (1984); Illinois v. Krull, 480 US 340, 347 (1987); Arizona v. Evans, 514 US 1, 11 (1995); Herring v. United States, 555 US 135, 141 (2009). See, e.g., Evidence Act 1995 (Cth) s 138(3) (Austl. ); Evidence Act 2006, § 30(3) (N.Z. ); R v. Grant  2 SCR 353, §§ 73–75 (Can. ); R v. Canale (1990) 91 Cr. App. R. 1 (Eng. ); Israel Supreme Court, Yissacharov v. Chief Military Prosecutor, Judgment of 4 May 2006, CrimA 5121/98, § 62 (Justice Beinisch). See, e.g., Lafave, 2009 at 768–70. Wong Sun v. United States, 371 US 471 (1963). R v. Grant  SCC 32; Israel Supreme Court, Yissacharov v. Chief Military Prosecutor, Judgment of 4 May 2006, CrimA 5121/98, §§ 47, 68 (Justice Beinisch). R v. Grant  SCC 32, § 76; R v. Harris  ONCA 574, § 63; R. v. Bacchus  ONSC 5082, §§ 90–93. R v. Grant  SCC 32, § 76. Israel Supreme Court, Yissacharov v. Chief Military Prosecutor, Judgment of 4 May 2006, CrimA 5121/98, § 70 (Justice Beinisch). R v. Grant  2 SCR 353, §§ 75, 214 (Can. ); Stuart, 2010 at 314, 318; Porter/Kettles, 2012. R v. Grant  2 SCR 353, § 75 (Can.) (“[I]gnorance of [constitutional] standards must not be rewarded or encouraged and negligence or wilful blindness cannot be equated with good faith.”); R v. Wilson  CarswellOnt 9051 (citing unnamed case in which trial judge excluded evidence where officer relied on an invalid warrant in good faith); R v. R (J.F.R.) YJ No. 235 (Can. Yukon Terr. Ct.) (excluding evidence in a case of negligent police violation of the law). R v. Grant  2 SCR 235 (Can.). Interestingly, the Canadian Court argued that the admission of evidence that would have been inevitably discovered has a lesser impact on the rights of the accused—a position criticized by some Canadian scholars; see Stuart, 2010 at 330. See, e.g., Israel Supreme Court, Yissacharov v. Chief Military Prosecutor, Judgment of 4 May 2006, CrimA 5121/98, § 71 (Justice Beinisch) (leaving exclusion of derivative evidence to case-by-case determination). R v. Edwards  1 SCR 128; see also R v. Pasian  ONSC 1557. See, e.g., Paciocco, 2011 at 32 (“If the repute of the administration of justice is indeed harmed by the admission of evidence it must be so whether or not the person whose rights have been violated complains. And if an objective is to vindicate Charter rights generally and not in the individual case it makes no sense for the framers of s. 24(2) to have linked the operation of the remedy to an application by the party whose rights have been violated.”). See Levine et al., 2016. See, e.g., Herring v. United States, 555 US 135 (2009). Id. at 173–174 (Ginsburg, J., dissenting). See Costello v. United States, 365 US 265, 280 (1961). Brown v. Illinois, 422 US 590, 603–604 (1975); Murray v. United States, 487 US 533, 537 (1988). “If the prosecution can establish by a preponderance of the evidence that the information ultimately or inevitably would have been discovered by lawful means—here the volunteers’ search—then the deterrence rationale has so little basis that the evidence should be received. The requirement that the prosecution must prove the absence of bad faith … wholly fails to take into account the enormous societal cost of excluding truth in the search for truth in the administration of justice.” Nix v. Williams, 467 US 431, 444–445 (1984). Rakas v. Illinois, 439 US 128, 137–138 (1978); Fisher v. United States, 425 US 391, 397–398 (1976). United States v. Payner, 447 US 727 (1980). Rakas v. Illinois, 439 US 128, 137–138 (1978). Giannoulopoulos, 2007 at 192, 207–208; see also Kaissis, 2015 at 461–462. Trimbole v. Governor of Mountjoy Prison  IR 550, 573. Daly, 2011 at 199; Director of Public Prosecutions v. JC  IESC 31, § 95 (noting that the previous rule called for “near absolute exclusion” and was “the most extreme” in the common law world). Director of Public Prosecutions v. JC  IESC 31, § 95. Director of Public Prosecutions v. Kenny  2 IR 110, 134 (Ir. ); Thaman, 2010 at 352. Director of Public Prosecutions v. JC  IESC 31. Id. at § 97 (“When does the admission of that evidence itself bring the administration of justice in to disrepute? This analysis leads inevitably to a more nuanced position which would admit evidence by reason of a technical and excusable breach, but would exclude it where it was obtained as a result of a deliberate breach of the Constitution.”); Leon/Ward, 2015 at 593. Slobogin, 2016 at 291 (reviewing countries that follow the rights vindication model and finding that they undermine the rule-as-vindication rationale in various ways). Lewis, 2011 at 648; see also Chen, 2011 at 719–720 (noting that the Taiwanese judiciary adopted the exclusionary rule in an effort to assert its independence and to gain legitimacy by protecting human rights). Lin et al., 2019 at 1. See Thaman, 2013 at 416–417 (discussing exclusionary rules in Spain, Colombia, Brazil, Portugal, Greece, and Germany); Macula, 2019; Lin et al., 2019. Lin et al., 2019 at 3.1.3. Bundesgerichtshof [BGH] [Federal Court of Justice] Judgment of 18 April 2007, 51 Entscheidungen des Bundesgerichtshofes in Strafsachen 285, 2007 (Ger.) (upholding exclusion where the police “intentionally circumvented the protective warrant requirement”); Bundesverfassungsgericht [Federal Constitutional Court], Judgment of 9 November 2011,  Neue Juristische Wochenschrift 2417 (Ger.) (stating that evidence would be excluded “if there has been a grave, conscious, or arbitrary violation of procedural law which infringed upon the protection of an individual’s fundamental rights in a planned or systematic fashion”). One of us has noted a trend toward exclusion in recent German decisions, “especially where important individual rights have been violated and the law enforcement officer acted without good faith.”; Weigend, 2015 at 195. Bachmaier Winter, 2013 at 216–217. Lin et al., 2019 at 3.2.6. Lin et al., 2019 at 3.2.6.2 (quoting Supreme Court decision 102 taishangzih No. 4177 (最高法院102年度台上字第4177號判決)). Bachmaier Winter, 2013 at 232. Macula 2019; Weigend, 2019 (in this volume) German report at notes 98 et seq. BGH, Decision of 21 January 1958—GSSt 4/57 (11 Entscheidungen des Bundesgerichtshofes in Strafsachen 213, 215).